Story telling is a fantastic and important way of passing on history and is still being used by indigenous people around the world as a way of recording their passage in time. 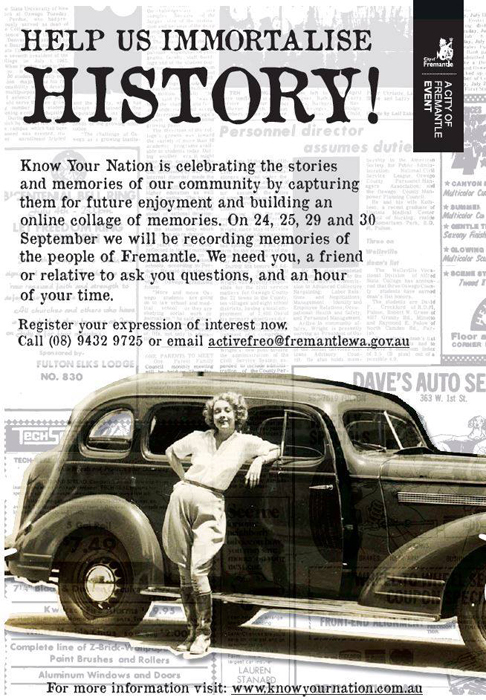 Fremantle people are now asked to participate in KNOW YOUR NATION a project that will be audio recording their stories, where two generations come together and the younger person will listen to and ask questions about the older person’s life. That younger person can be a friend, family member or even a stranger, so if you want to tell your story contact activefreo@fremantle.wa.gov.au or call 9432 9725.